Uniontown’s three losses are to Madison, Chetopa and Marais des Cygnes Valley. The Eagles fell 37-36 to Marais des Cygnes Valley in the first week of districts before bouncing back with lopsided wins over Pleasanton and Waverly to earn a spot in the playoffs. Out of Uniontown’s six wins, the Eagles have held opponents to six points or fewer in four of them. Fifth-ranked Udall mostly rolled through the regular season. Other than a 14-12 win over Caldwell in Week 2, the Eagles have won every game by 25 points or more. Junior quarterback Nolan Williams has passed and rushed for almost 800 yards each. Junior Dalton Loos has rushed for more than 1,000 yards and 20 touchdowns on 152 carries. Sophomore Sweed Wilkey has 16 catches for more than 400 yards. Senior Hunter Kistler leads the Udall defense with almost 100 tackles. Tanner Bonnell has posted nine sacks. 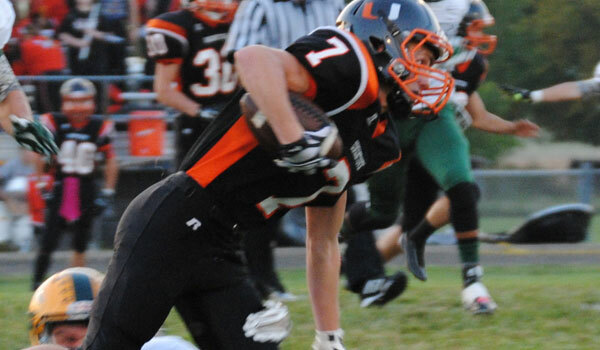 Osborne had its 21-game winning streak end with a 54-26 road loss against Hanover, ranked No. 1 in Eight-Man, Division I.
Osborne, Peabody-Burns and Pratt-Skyline are all tied for seventh in the classification with 444 points. Peabody-Burns, though, is tied for third in scoring defense with just 110 points permitted. Last year, Peabody-Burns allowed just 17.4 points per contest en route to a win against Madison and a district championship. This year, the Warriors also defeated Madison for the district crown. Senior Braxton Kyle has completed 28 of 65 passes for 682 yards with nine score against four interceptions. He has also rushed 102 times for 789 yards and 20 scores. Junior Clayton Philpott has 115 carries for 912 yards and 14 scores. Peaboby-Burns has 51 tackles for loss and forced 26 turnovers. Peabody-Burns has not moved past the Round of 16 since 2003. In the last four years, Osborne has gone 10-2, 10-2, 6-3, 13-0 with a state championship and now 8-1. Junior quarterback Jake Tiernan has completed 103 of 147 passes for 1,576 yards with 24 scores against six interceptions, including three in the loss to Hanover last week. Tiernan has accounted for 2,002 yards (passing and rushing) with just seven turnovers. His 9.0 yards per offensive snap is slightly better than Kyle’s 8.8. Senior Brandt Wolters, with 53 catches for 810 yards and 13 scores and 100 tackles, has proved matchup problems for everyone, including Hanover. Tiernan and Wolters will be too much as the defending champs win. Both of these squads are senior-laden and have enjoyed big improvements from 2013. Little River brought back six starters on both sides of the ball, including five seniors. Little River has enjoyed a two-win improvement. This marks the Redskins’ second playoff appearance since 2005. Skyline has a plus-three win improvement after it brought back seven offensive and eight defensive starters and reached the playoffs for the first time in 15 years. For Skyline, senior Dustin Weber has 196 carries for 1,396 yards and 19 scores, and senior Daniel Hacker has 86 carries for 696 yards and 17 touchdowns. Junior Brady McComb has registered six of the team’s 25 sacks. Little River is also very run-heavy with 187 rushing yards a contest and 66 passing yards. Senior Grant Harvey has 119 carries for 935 yards and 17 scores. Little River took a 22-6 loss to Central Plains and held standout quarterback Braedan Crites to 6 of 20 passing for 75 yards and a score. No opponent, though, has been able to slow Skyline’s rushing attack. Oberlin has enjoyed a big year in its first season in the eight-man ranks and has made the playoffs three straight years under coach Joe Dreher, who turned around a struggling program. Oberlin junior quarterback Noah Nelson has completed 64 of 104 passes for 894 yards with 13 TDs against five interceptions. Junior Bryson Wesley has 110 carries for 910 yards and 18 TDs. Senior Rex Diederich has 82 tackles, 12 for loss, both team-highs. Oberlin has forced 30 turnovers and scored three defensive/special teams touchdowns. The Red Devils have outscored opponents 433-254. Ness City won a thriller, 50-48, in overtime against Hodgeman County to reach the playoffs. The Eagles have outscored teams 448-218 on the season. Quarterback Tanner McMillen and Pedro Flores have combined for more than 1,100 rushing yards and each averaged more than eight yards a carry. McMillen has passed for more than 700 yards, mainly to Kyle Harris and Flores. This is going to be an outstanding matchup that could go either way. Both teams have depth at the skill positions, and the difference becomes whether Flores – Ness City’s outstanding running back who battles health issues – can produce at a high rate. Uniontown, Udall, Osborne, Peabody-Burns, Little River, Pratt-Skyline, Ness City, Oberlin-Decatur Co., 8M-I Playoffs, Class 8M-I, Marais des Cygnes Valley, Cedar Vale-Dexter, Hanover, Madison, Central Plains, South Central, Spearville, Atwood-Rawlins Co.